Haseena Naji is from Kerala and currently pursuing her doctoral degree programme at the Central University of Tamil Nadu, Thiruvarur. She has completed her post graduation in English language and literature from Fatima Mata National College, Kollam, Kerala. 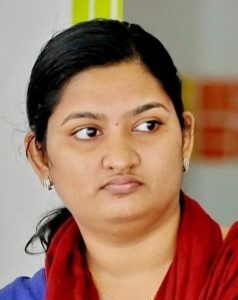 Before joining Central University of Tamil Nadu in 2016, she had been working with several educational institutions in rural areas, including Auroville, Pondicherry, with the aim of empowering the village folk. Her areas of interest include eco-feminism, North East Indian literature, mythology and folkloristics. She has published several research articles in reputed journals and has presented 10 papers at international conferences. She is also one of the Coordinators for Kerala (South) Region of FSLE-India.